One of the hallmarks of the American spirit is competitiveness. We love to root for the underdog. Comeback stories make us cheer for the protagonist. We love the competitive nature of sports—just look at the legions of loyal fans of college football. That competitive spirit isn’t limited to sports. The desire to be better, to be more successful, to surpass the status quo or get the next promotion is engrained in us. Each of us wants to be successful in our own arena. For the armed professional (military, LEO, security contractor, etc.) the desire to be better is a required quality. In these job fields the need to be the best is tied directly to the success—read livelihood—of each person. The cold, hard reality in these specific fields is that not being the best, or taking second place, is usually associated with bodily harm or death. That raises the stakes exponentially for the armed professional and requires a consistent and specific need for quality training. Sport specific training is a theory that designs fitness training programs specifically for the enhancement of athletic performance relative to a given sport. Athletes across many disciplines use sport specific training to enhance their capabilities. This approach to training can be applied to shooting and other defensive related training. The knowledge that fitness directly impacts the capabilities of armed professionals across a broad spectrum of mission requirements has led to the development of what people call the tactical athlete. The term tactical athlete is championed in the military but can apply to any employee in a high-risk job field. The tactical athlete describes the individual who works in a high-risk career field and trains their body, mind, and tactical skill sets in order to perform at the highest level achievable. Sorinex is a well-known company in the exercise equipment industry, producing quality exercise equipment for almost 40 years. Richard Sorin started making exercise equipment in his garage for local high schools in 1980. Since then Sorinex has grown to work with and outfit gyms across the nation including physical fitness training facilities for high schools, colleges, military, NFL, NBA, NHL, and MLB teams. The idea behind the SITT Sled is to provide armed professionals with a tool that can augment not only their shooting but their fitness training simultaneously. Any military or law enforcement officer will tell you that fitness plays an important role in their job. Fitness is an important component for success in any arena that pits man against man. It is an irrefutable truth. The SITT Sled helps bridge the gap between the two disciplines of tactical training and fitness training. By incorporating the SITT Sled from Sorinex into a training plan on a regular basis the tactical athlete gains the capability to train across multiple physical fitness spectrums while incorporating the skill required for the employment of their specific weapon system. During a session with the SITT Sled the tactical athlete can work the core, arms, shoulders, legs and cardio respiratory fitness all while honing their skill set with their weapon system. The SITT Sled uses a combination of explosive strength and resistance training in order to improve the physical strength, conditioning and efficiency of the athlete. Training programs utilizing the SITT Sled for athletic and skill based performance can see improvements in their athletes in areas such as strength, power, speed, agility, and durability; all while enhancing the shooting skills of draw, presentation, sight alignment/sight picture, target transitions, grip strength, positional shooting and shooting under physical stress. The SITT Sled from Sorinex is a tried and tested tool for the tactical athlete to use to improve their capabilities to move and shoot effectively and efficiently. The SITT Sled is a versatile system that offers a myriad of training options that be incorporated into range sessions. While the components of the SITT are fundamentally simple they offer training options that are unique and challenging. The SITT’s combination of durability, simplicity and versatility make it an incredibly intriguing tool to augment and enhance existing training plans. The foundation of the SITT system is the sled itself. The sled weighs 70.5 pounds and can be loaded with weights, sand bags or other objects to increase the weight and difficulty of training. The SITT comes with a 10’ Cordura utility strap that can be used to pull or drag the sled during training sessions. The sled can also be pushed using the base of the sled itself or using the Push Handle. The SITT Sled comes in two configurations: the SITT Sled Basic Package and the SITT Sled Uber Package. The SITT Sled Uber Package contains an extra set of heavy resistance bands (red) and a pushing handle for the sled. Each of these features can also be purchased individually as accessories for the Basic Package if you decide you want to upgrade. Sorinex also offers on site multi day training packages that include their Basic SITT class and their Advanced SITT Course for Instructor Certification. The SITT Sled Basic Package comes with two sets of resistance bands, color coded yellow and black. The yellow resistance bands come with wrist wraps that secure via hook and loop tape. The resistance bands can be used in conjunction with firearms training or training with blades, impact weapons or empty hands. Using the resistance bands while training the draw, presentation, sight alignment/sight picture and transitions with the pistol adds difficulty to the training while training the muscles and the brain to work together in order to become stronger and more efficient in those positions. Similarly, the weapon retention bands (black) offer many of the same features as the standard resistance bands but are specifically for the rifle. The weapon resistance band is attached directly to the end of the rifle to create resistance in the presentation of the rifle, time on target or at an elevated ready position, and transitions between target. One unique feature of the SITT system is the inclusion of the resistance poles. Each SITT Sled package comes with three of these poles. The resistance poles attach directly to the sled and can be easily removed based on the training needs. The resistance poles can be used in a variety of ways. They can be used to simulate shooting around cover or to simulate controlling civilians/noncombatants while engaging threats. They can also be used to work shooting from unconventional, uncomfortable or compromised positions, as well as shooting against physical resistance, working hard transitions, and good old-fashioned core strength and stability work. Every piece of the SITT Sled Package is engineered to serve a specific purpose. That purpose is to enhance the capabilities of the armed professional. The Warrior Expo East 2017, hosted by ADS, Inc. had a lot of great products and companies on display and brought industry-leading solutions to end users, program managers, and procurement specialists. The Warrior Expo is where Mike Kurcina (HMFIC at SpotterUp) first spotted the Sorinex SITTSled and got a chance to meet with Sorinex representative Dan Ramsey. Based on their conversation at The Warrior Expo, Mike could see the potential of the SITT system and asked Dan to get SpotterUp on the calendar for a training event. First things first: I want to say thank you to Dan for making the drive up to Virginia to meet with the Spotter Up team. It wasn’t a short drive and the willingness to make the trip speaks volumes about the people behind the Sorinex brand. The SITT Sled from Sorinex is a neat piece of equipment and we had a blast getting the opportunity to put it through its paces. On a sunny afternoon, we gathered on a quiet piece of property tucked away in Manassas to get our chance working with the SITT Sled. 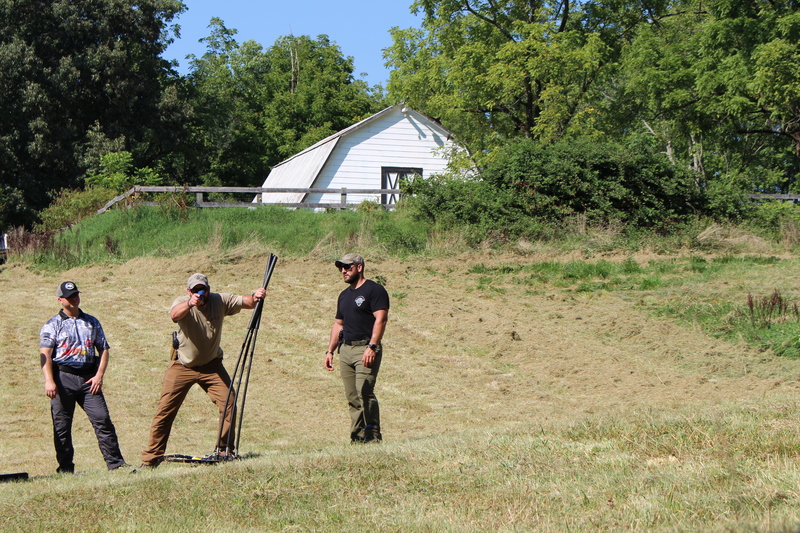 After introductions were complete and the range was set up, Dan started working us through drills with the SITT Sled. Dan worked us through pistol drills using the resistance straps and a blue gun. We started by working the presentation with the resistance bands attached to our wrists. The resistance bands forced us to move deliberately while lighting up the muscles of the arms, shoulders, and core. The straps highlight each muscle group used during the presentation. Dan said he has been able to shave two tenths of a second off of his draw and presentation using the resistance straps. Two tenths of a second might not sound like much, but in a time-is-life situation every fraction of a second matters. We should all take two tenths when we can get them. After working the presentation of the pistol, we worked staying on target with proper sight alignment/sight picture with the stress of the resistance bands. This was basically a static hold trying to maintain the shooting fundamentals while the muscles involved were under tension/stress. We then moved into transitions between targets. This presented an interesting work out trying to keep the pistol up while transitioning between targets with the bands pulling down on our wrists. We also worked using the weapon retention bands starting with a blue gun and then progressing to using our rifles. We worked, changing elevation with variations of moving from standing to kneeling and back to standing. As with the pistol earlier, we worked the presentation, sight alignment/sight picture and transitions with the rifles. The resistance bands are an interesting training tool. The drills using the resistance bands highlighted how the system can be used to strengthen and develop the muscles specific to the employment of a weapon. The strengthening of the muscles involved in the draw, presentation, time on target and transitions should eventually make the movements easier, thus more efficient. Becoming more efficient means faster, more accurate employment of the given weapon system with less fatigue to the operator. As stated before, any advantage in speed, accuracy, or efficiency is something every professional should be happy to gain, no matter how incremental. One key factor with the resistance bands is the need to recalibrate after using the resistance bands. As with any task, the brain will learn and adjust to the task with consistent repetitions. It is important when incorporating the resistance bands to work some reps without them to recalibrate where your draw and presentation should be in order to align your sights on target as quickly as possible. While the SITT Sled is a great tool to augment training, it should not be the only tool used. We then moved on to using the resistance poles. Again, we started with the blue gun to gain familiarity with the system and the resistance provided by the poles. Once acclimated to the poles, we began using two of the poles to work hard transitions against resistance. After which we moved to punching through the poles to engage targets, which could simulate using the pistol as an impact weapon. We then started using all three poles together to simulate shooting around cover. We progressed to moving the poles out-of-the-way in order to engage targets, which could easily simulate controlling a noncombatant while engaging threats. The resistance poles are a great training tool. They can be used to simulate many situations that reflect real world applications. They can also be used to strengthen the core, which aids in the stability of the shooting platform especially during transitions, shooting on the move, and shooting from nonstandard or compromised positions. We then worked with the SITT Sled as a standalone device. We used the sled to simulate dragging a wounded teammate out of harm’s way while engaging targets. Moving the sled definitely raises the heart rate. The physiological stress of an increased heart rate makes shooting a more challenging endeavor. This in turn forces the user to concentrate on the fundamentals while under physical stress. The sled is a great tool for incorporating conditioning in your training plan. It can be used in a multitude of ways. The danger of working under increased physical stress is if the shooter is too fatigued to maintain the proper fundamentals and achieve effective hits on target. As with any training aid it needs to be understood and properly implemented in a training plan so as to not become a hindrance to the development of the shooter. To that end we highly recommend if you decide to use the SITT Sled Package you also take advantage of the training packages Sorinex offers with the SITT Sled. The SITT Sled offers a simple, durable, and functional training tool for the tactical athlete. It is an excellent tool to enhance the fitness and skill of the end-user. Combined with a regular training plan, the SITT Sled has the capability to directly contribute to the growth and development of the end user’s skill set as a tactical athlete. That capability paired with excellent customer service and a limited lifetime warranty make the SITT Sled from Sorinex a great value. The bottom line is this: The SITT Sled is not a magical elixir. It won’t magically change your shooting ability or instantly make you more athletic or fit. What it will do is provide unique training opportunities to develop the strength and conditioning specific to the martial skill sets. It is a tool that when used appropriately can help develop the overall effectiveness and efficiency of the armed professional. It can help you gain the edge—through consistent work—that everyone is looking for. After all, every advantage is worth seeking when life and death are the stakes. The SITT Sled system is exclusively available to DOD, LEO, Federal and SITT Certified Instructors. For more information, contact ADS, Inc. The grandson of two veterans, Nate found a passion for the military and firearms at a very young age. He is an 8+ year veteran of the U.S. Army Infantry with over 22 months deployed in operational environments. Nate is a student of the gun and of all things based around the employment thereof. Nate is a lifelong shooter, firearms enthusiast, concealed carry advocate, competitive shooter and instructor. He has a passion for gaining and sharing knowledge as well as challenging people to think critically about their approach to techniques and tactics. Nate is voracious reader and consummate researcher. He has a bachelor’s degree in History and Political Science and his hobbies include all things related to the gun, studying the human condition, and working out. He enjoys the quiet times when his Belgian Malinois, Kairo, and Dutch Shepherd, Titan, aren’t begging for his attention.